^ "Main Rivers". National Conditions. 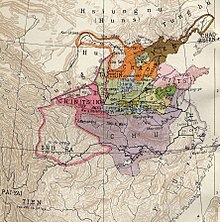 China.org.cn. Retrieved 2010-07-27. 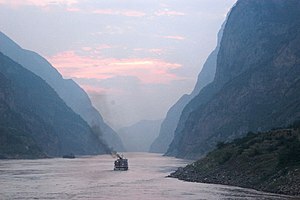 ^ "Three Gorges Says Yangtze River Flow Surpasses 1998". Bloomberg Businessweek. 2010-07-20. Retrieved 2010-07-27. ^ London Missionary Society, ed. (1869). Fruits of Toil in the London Missionary Society. London: John Snow & Co. p. 64. Retrieved 12 September 2016. 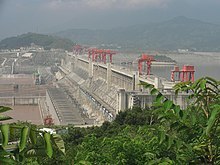 ^ "Three Gorges Dam, China : Image of the Day". earthobservatory.nasa.gov. 2009-06-08. Retrieved 2009-11-03. George, Jamieson (1911). 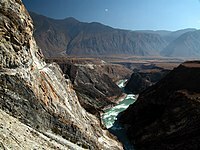 "Yangtsze-Kiang" . In Chisholm, Hugh. Encyclopædia Britannica. 28 (11th ed.). Cambridge University Press. p. 903. ^ "Baidu Baike: Lujiang". Retrieved 2015-03-10. 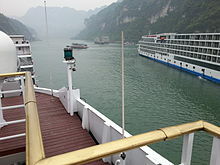 ^ "Yangtze River floods". Encyclopedia Britannica. Retrieved 2018-01-20. ^ "Yayoi linked to Yangtze area". www.trussel.com. Retrieved 2017-03-26. ^ 98年特大洪水. Chinanews.com.cn. Retrieved 2009-08-01. ^ Schmidt, Christian; Krauth, Tobias; Wagner, Stephan (2017-10-11). "Export of Plastic Debris by Rivers into the Sea". Environmental Science & Technology. 51 (21): 12246–12253. doi:10.1021/acs.est.7b02368. ISSN 0013-936X. PMID 29019247. ^ "The Chinese river dolphin was functionally extinct". baiji.org. 2006-12-13. Archived from the original on January 4, 2007. Retrieved 2006-12-13. ^ Didžiulis, Viktoras. "NOBANIS – Invasive Alien Species Fact Sheet – Craspedacusta sowerbyi" (PDF). Archived (PDF) from the original on 17 May 2014. Retrieved 28 September 2016.